Rocky Votolato albums all have a similar feelings: a detailed singer-songwriter sings a heartfelt song you’re going to love. 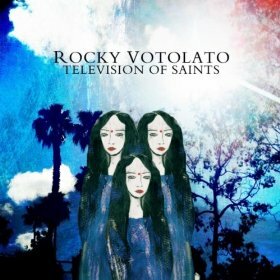 Filling in the gap between Elliot Smith and Cary Brothers, Television of Saints is a great album for anyone looking to hear an honest song. “Little Spring” sounds a bit like a Bob Dylan meets Matt Costa track. It’s more vocal-focused and really brings the tone of his voice to the forefront. The highlight of other tracks on the album like “Sparks” are the guitar lines. Soft, simple, and delicate, each strummed note makes the song what it is. Lyrics like “please describe in detail” are the perfect compliment to the album. Every single lyric, every note is as detailed as can be on the album. Our personal favorite is “Fool’s Gold,” featuring a bit more energy and lyrics that describe common feelings — needless to say, the track stands out. Lyrics like “chasing fool’s gold/leave it alone,” tell us all an important lesson we can take away long after the track has ended. Look to Rocky Votolato‘s latest release to keep you company if you’re in the mood for another singer-songwriter.